Sometimes our children are tempted to give up when things get hard, or when something is taking too long, or things are not working out the way they had planned (or insert any other difficulty here). 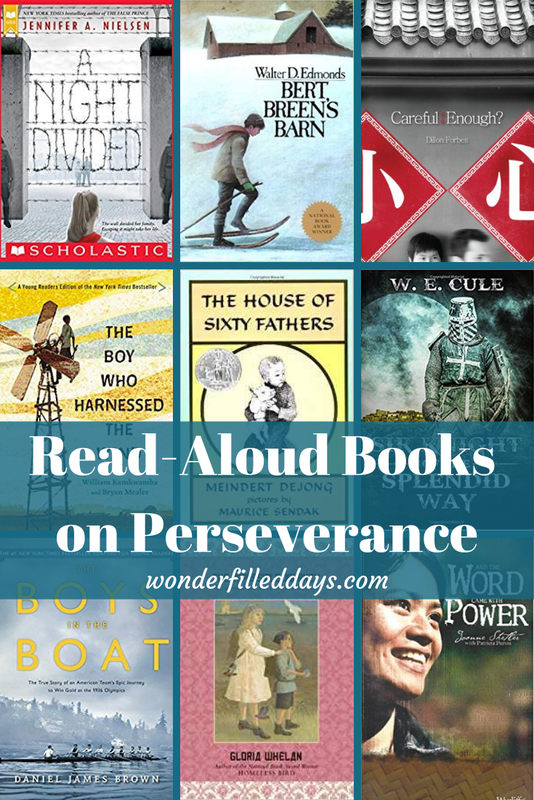 Here are some incredible stories of children (and adults) who did not give up when faced with difficulties. Whether you are reading about a brother and sister trying to dig a tunnel to freedom under the watchful eye of the police, a boy persevering in trying to be a witness to his friends when he felt like giving up, or a young boy buying and moving a barn, I think you and your children will find these stories inspiring. I’ve included some cautions with some of the books. I hesitate to do this, in case I miss something obvious and highlight something that you feel isn’t important. Please proofread the books yourself if you have concerns. I read this book in two nights because nobody wanted to let me stop the second night, including my husband. That’s four hours of reading in one night! 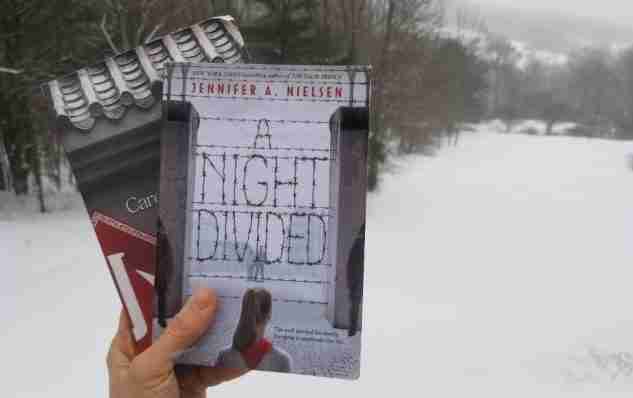 A Night Divided by Jennifer A. Nielsen is a suspenseful book written during the time of the Berlin Wall. Besides being exciting, it was also a thought-provoking look at the different views that those living in Berlin had on the wall. I haven’t seen many other books set during this time period. Objectionable content: There are a few deaths. Most of them are off scene, but one of them not, but nothing graphic. I also recently read Jennifer Nielsen’s book Resistance. This book is much more violent. After all, it is about the Jewish resistance to German-occupied Poland. I do appreciate how in both books Nielsen does not ignore the impact that her characters’ faith had on the decisions they made. In Careful Enough by Dillon Forbes, Daniel and his parents move to China as missionaries. There he struggles with the question of what the difference is between being “cautious” and being “ashamed.” He lives under the constant strain of knowing what he says might put his friends in danger. Is it even worth trying to be a witness in China? Bert Breen’s Barn is the story of how a boy will not give up on his dream to own an old barn. How he earned the money to purchase the barn, and then how he worked to move the barn to his families land is a story of perseverance that will seem foreign in these days. Objectionable content: Some rough language we skipped over. The Impossible Journey by Gloria Whelan is about a brother and sister who set out on a journey into Siberia to find their parents. They overcome many difficulties throughout their journey. You might want to read Angel on the Square by the same author first. These books are part of a four part series. The House of Sixty Fathers tells the story of a young Chinese boy who is separated from his parents during the Japanese occupation. The story of his journey to try to find them kept us reading “just one more chapter.” A heart-breaking story as you realize that war has few happy endings. Cautions: Frequently mentions Chinese religious beliefs and superstitions. The House of Sixty Fathers gives children a glimpse into the horrors of war, but there is nothing graphic (villages are burned, people get shot, but nothing very detailed). The Boys in the Boat was a great book about the American rowing team that went on to the 1936 Berlin Olympics. Most of the boys came from poor, hardworking backgrounds. (The main character’s childhood was heart-breaking.) Yet they triumphed against staggering odds to not only win against the more elite wealthy teams here in the United States, but to go on and take the Olympic Gold in Berlin. The book gave a good glimpse into pre-WWII Germany and the deceptive front that Hitler tried to put on to trick the rest of the world into thinking that all was well in Germany. Even so, the American team knew they were racing for much more than themselves, but for the triumph of freedom and equality for all men. Objectionable content: We read the young reader’s edition and did not encounter anything that we found objectionable. The main-character’s younger brother was badly burnt as a child. It also mentions some of the atrocities that were going on in Germany, but the book doesn’t go into detail. Sir Knight of the Splendid Way is an allegory, much like Pilgrim’s Progress, that tells the story of Sir Constance as he travels to the City of the Great King. We listened to Lamplighter Theater’s audio dramatization of this book. The Kindle edition is only 99 cents at the time of this writing. The Boy Who Harnessed the Wind is about a young boy who uses his love of engineering to help his family and ultimately his whole village after famine strikes their African village. Again, we read the Young Reader’s edition. Cautions: There were some hard things that happened as a result of the famine. And the Word Came With Power is about Joanne Shetler and her work among the Balangao people of the Philippines. It emphasizes how God is in control and has a plan for our lives. Even though we don’t understand why things happen the way they do, He can use anything for His glory. A powerful book that will build faith in the power of God’s word. I liked how Joanne Shetler pointed out that her dad had raised her to obey unquestioningly, so that God asked her to give her life to missions, she did not think about disobeying Him. I’m sure many more books could be added to this list. I’d love to hear your suggestions! Evidence Not Seen by Darlene Deibler Rose is a faith building story. She and her husband were missionaries to Pupua New Guinea before WW2 and the Japanese occupation. My daughter who originally didn’t want me reading this story as she thought it too hard to listen to wound up asking each night for me to keep reading. We took it slowly as there is a lot to process as you go. Also, have you read any of the YWAM Then and Now stories? Youth With a Mission (YWAM) publishes these great heroes of the faith biographies. Well worth every penny spent on them. Little by little we are enlarging our library of these. Thanks for reminding me about that book! I have it on my Kindle and will recommend it to my boys who were too young to read it when I bought it. I mention the YWAM books in this post: https://wonderfilleddays.com/childrens-books-about-courage/. We have quite a few of them, and Heart of Dakota (our home school curriculum) schedules in some of them so we’ve added to our library that way, too.